Insight: Uber needed a unique and inspiring way to gather qualitative research from business travelers at their Dreamforce booth. 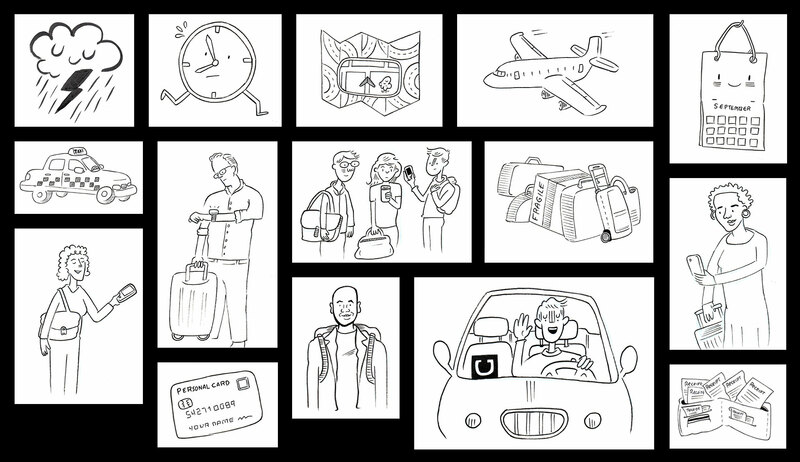 Visual prompts of common good and bad travel experiences could help provide that spark and ice breaker for people to share their stories and help Uber discover new unmet needs for business travelers. Goal: To provide evocative images that inspire people to share their good and bad business travel stories. Challenges: Developed 44 Illustrations of emoticons, contexts, people and objects that needed to be clear, relatable and help people recall their own personal stories.